Partez à l'aventure d'un océan à l'autre et voyagez de Dublin aux falaises de Moher et à Doolin. En route vers la côte ouest rugueuse de l’Irlande, vous traverserez la région du Burren avec ses paysages de roches calcaires, puis le long du Wild Atlantic Way. 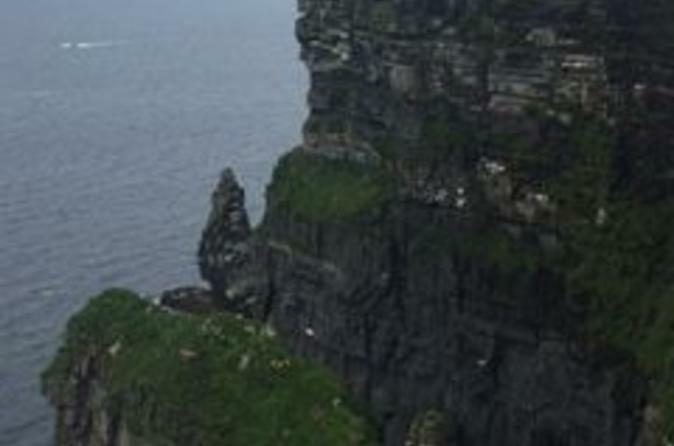 Passez du temps aux falaises de Moher pour visiter le centre d'accueil des visiteurs et explorer les sentiers de randonnée. Profitez ensuite de votre temps libre à Doolin, un petit village réputé pour sa musique irlandaise traditionnelle. Une boisson chaude gratuite est incluse pendant votre voyage. Cette visite des falaises de Moher vous emmène dans le village rarement visité de Doolin, où vous avez du temps libre pour explorer. Faites-vous chercher à votre hôtel dans le centre de Dublin, puis quittez la ville en autocar de luxe tout en écoutant les commentaires de votre guide. Votre itinéraire passe par le Burren, une région rocheuse connue pour son paysage calcaire, et le long des routes du Wild Atlantic Way. S'étendant le long de la côte ouest de l'Irlande, la route empruntée par la route prend la direction des falaises de Moher, site du patrimoine mondial de l'UNESCO. Arrêtez-vous pour visiter les falaises vertigineuses qui dominent la mer et suivez les sentiers pour trouver les meilleurs points de vue. L'admission au centre d'accueil souterrain des falaises de Moher et son présentoir sur le bord de l'Atlantique sont inclus. Si vous voulez voir la merveille naturelle de la mer, faites une promenade en bateau autour des falaises à vos propres frais. Ensuite, retournez à votre autocar pour vous rendre à Doolin. Le village est souvent appelé le foyer de la musique traditionnelle irlandaise et vous aurez du temps libre pour visiter les pubs et les restaurants où jouent souvent des groupes et des musiciens. Rendez-vous avec votre guide à l'heure convenue et retournez à Dublin. Votre excursion d'une journée se termine à 19h30. We saved this for the last day of our amazing vacation to Ireland and let me tell you, this was the pinnacle! We loved going to the Cliffs! It was amazing to climb up there, so be prepared to hike. Our day was misty, but I think it just enhanced the experience. We also had a great time in Doolin. Stopped at a pub and had a great lunch/early dinner. Overall I can't brag on this tour enough. I had a very pleasant experience in this tour. The Driver, Brian, who also was our guide was very good and helpful. Everything was very well organized and timely. I had a wonderful trip. I'll highly recommend this tour to anyone. This trip to any Visitors to Ireland. The cliffs are otherworldly and definitely worth seeing. Due to some issues, we were rerouted to the Burren and it was interesting. However, we stopped at 5 other hotels to pick up passengers, wasting 1.15 hours in the morning. The toilet on the day long bus tour was not working and we had to make several rest stops. The wifi didn't work either. It was a double decker bus and the top level swayed horribly. There were a number of issues with this tour. First, while our driver was very friendly, he was a driver, not a tour guide, so most of the time we spent on the bus was in silence. Tour details stated we would have a professional guide. When we moved to a new area I think we passed through 4, he told us a little about it, but in total that was probably 20 minutes of the 9 hours we spent on the bus. We were on the bus 9 hours because we had to take an alternate route going because of construction and had to backtrack an hour coming back to Dublin because of an accident, which obviously could not have been foreseen and avoided. The bathroom on the bus was out of order and we only stopped once going and once coming back and the coming back leg of the trip was 5 hours. Because we were behind we only got 1 hour at the Cliffs, with no suggestion of the best way to spend the time, before heading to Doolin for lunch. We stopped for 45 minutes at a hotel on the edge of town, so we didn't really get to go into Doolin at all, which was very disappointing because we really wanted to see the town. Tour details also stated that complimentary morning tea was included, but we didn't get anything until our one stop at a gas station halfway to the Cliffs, and we had to pay for our purchases ourselves. The view overlooking the Cliffs themselves was breathtaking, so please understand that it was this tour and not the destination I have issues with. 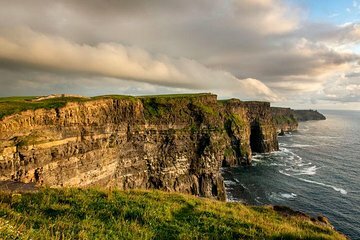 I recommend that anyone who is interested in traveling to the Cliffs of Moher from Dublin consider renting a car and making a 2 day trip of it, stopping in some of the little towns on the way to and from to truly experience the culture, which you can't do through the window on a bus.